The grave, soulful gaze with which small children regard the world is matched by director Nicolas Philibert&#146;s camera in To Be and To Have, a masterful documentary shot throughout a school year in a one-room schoolhouse in the countryside near France&#146;s Auvergne mountains. Philibert makes no effort to tell us what we&#146;re looking at. There is no voice-over narration and the school&#146;s location is never identified. Instead he just shows it, with long, unblinking takes: the French countryside, changing with the seasons; the children at work and play; their parents, unsmiling dairy farmers resigned to their unending labors. The children&#151;there are 13 of them, aged four to 11, broken into subgroups of les grands, les moyens, les petits&#151;work under the benevolent eye of Georges Lopez, a goateed, turtle-necked teacher in his last year before retirement. And it is Lopez&#146;s relationship with these children&#151;the demanding, inspiring, revelatory business of teaching&#151;that is the subject of this amazing film, along with the equally demanding, inspiring, and revelatory work being done by the children: the business of learning and of growing up. The child seen most is Jojo, the most talkative of les petits&#151;an impish four-year-old with a sly grin who is first seen learning the meaning of "seven." Some time later, he comes to grips with infinite numbers, as Lopez pushes him higher and higher, past hundreds, past thousands, from deux cents to deux milles to deux millions to deux milliards. It&#146;s an intimate, inspiring scene, and Philibert has the sense to keep his camera on it. By the time Jojo&#146;s in the billions, he is frankly bored. And so he responds as small children do when they&#146;ve had enough: he squirms, he fidgets, he changes the subject. It&#146;s all there, familiar to anyone who&#146;s ever had or taught children: I don&#146;t want to play this game anymore. It&#146;s a brilliant scene, precisely because the director gets past the feel-good message and on to another one, anchored in real life. 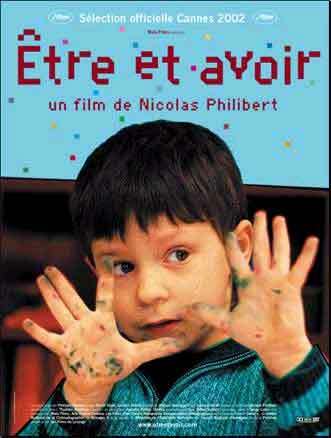 Philibert&#146;s camera moves from one intimate scene to another, seemingly invisible to the children. The director spent so much time with his subjects&#151;he shot more than 60 hours of film over a seven-month period&#151;that they are seemingly unaware of his presence, even in the most intimate circumstances. In another masterful take, Lopez counsels two of the older boys&#151;big, chunky 11-year-olds on the brink of adolescence&#151;after a schoolyard fight. He is off-camera; his voice is heard while the camera stares unblinkingly at the boys, one of them near tears, one tightly smiling, as their teacher calms, chastises, encourages, and reasons with them. Finally, after what feels like forever, they open up and tell him the cause of the fight. It&#146;s nothing, really, but it&#146;s taken the teacher a long time to bring them to this point and the director has calmly stayed with the scene until its resolution. This unnarrated documentary style bears some similarity to the technique of Frederick Wiseman, but the results are vastly different. Wiseman&#146;s works are exposes, scathing sociological commentary in which unsympathetic subjects are given ample time to damn themselves on camera. �tre et Avoir reveals only the teacher&#146;s&#151;and the director&#146;s&#151;love for the children and an aching nostalgia for a way of life that&#146;s on its way out, since even in France there are very few one-room schoolhouses left. The children&#146;s futures are clearly limited by their condition. They&#146;re the sons and daughters of farmers in an isolated corner of the French countryside and their parents&#146; education isn&#146;t much better than theirs. In one scene at home, the whole family pitches in to help as Julien struggles with his multiplication homework and they have trouble with it too. Julien is clearly not a scholar&#151;he barely makes it into the sixth grade&#151;and yet as he handles his chores around the farm, driving a tractor, cooking for his little sister, mucking out the stables, it&#146;s clear that he&#146;s already doing a man&#146;s work and that he loves it. He&#146;ll never go to college, but he&#146;ll make a good farmer and five years with Monsieur Lopez have taught him to be comfortable with that. In the only interview in the film, Lopez speaks directly to the camera, explaining that he comes from peasant stock himself, the son of a Spanish immigrant who wanted something better for his son and sacrificed to provide it. Lopez appreciates how far he has come and yet he is very comfortable with his surroundings here in a small town in the French countryside, living in an apartment over the school. He has given no thought to his retirement, he says, and will probably stay in the apartment unless the new teacher wants it. And so the school year goes by. Lopez gives dictation to the grands, does math with the moyens, introduces the petits to the intricacies of French grammar. (He teaches them about the mute e with two flash cards on which are written "ami" and "amie.") He takes them on picnics and toboggan rides. He takes them on a field trip to the frighteningly large school the grands will move on to after graduation from fifth grade and he welcomes a bunch of three-year-olds, next year&#146;s crop, on a visit to his classroom. At the end of the school year, as the petits hug him goodbye and run off into the summer, the camera patiently stays with him after the children are gone and we see the realization hit him that he won&#146;t be around in September when they come back. He won&#146;t see them again and neither will we. It&#146;s a devastating moment.